Crete Gorges are the magnificent monuments of nature and will give you a flavor of the beauty of this wonderful Greek Island. If you are an adventurous traveler, there are many opportunities to explore the great gorges and mountains in Crete. The options for hiking in the island are countless, so we have selected only the most popular and beautiful Crete Gorges. 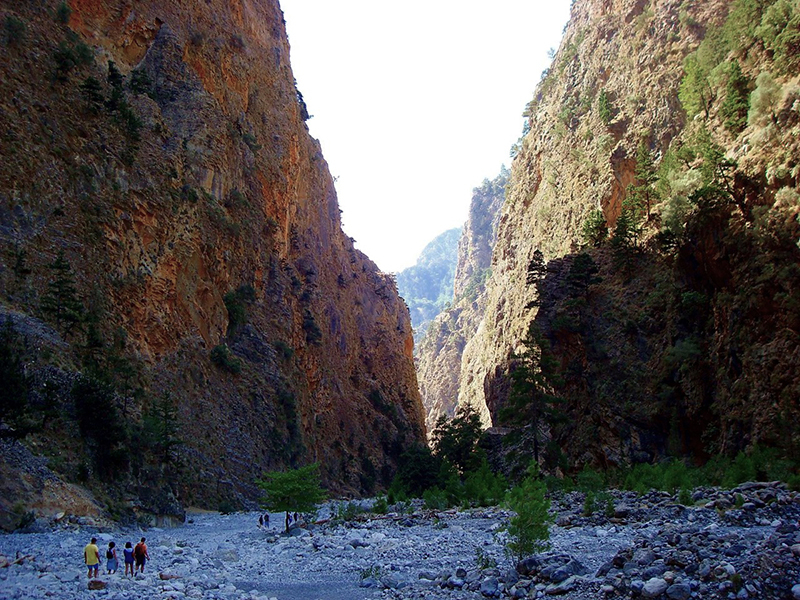 Samaria Gorge is one of the most famous Crete Gorges. It is located in the sierra of White Mountains in Chania. 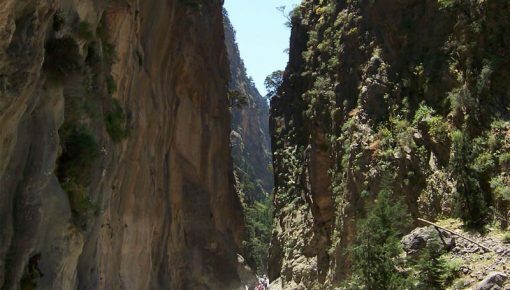 Its length is 18 km and is the longest gorge of Crete and Europe. It has a width from 150 meters to 3 meters, which is the narrowest point of the gorge, called “Doors”. In 1962 it was declared a National Park of Greece and residence of many endemic birds and different species. The most famous of the animals that find refuge in Samaria Gorge is the Cretan goat (Kri Kri). There also herbs and rare plants growing there, such as the wild burning bush and wild flowers. The entire trail is very well marked and is the most walked path in Greece. The path to the gorge begins from Omalos, at Xyloskalo point, at an altitude of 1,200 m. It is a narrow path that descends. From the very beginning you feel the awe dominating you: majestic mountains and an endless ravine gush in front of you! 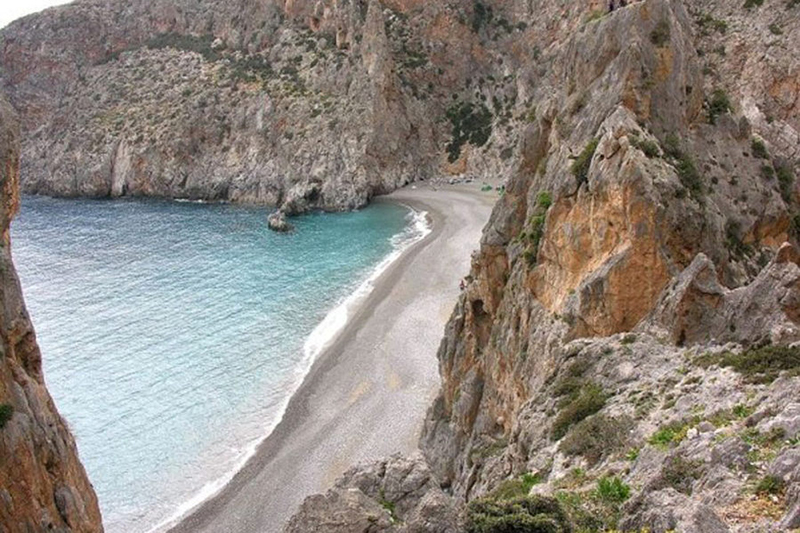 The end of the route is beautiful, as you face the Libyan Sea and the magnificent beach of Agia Roumeli! A refreshing dip in the sea and relaxing on the shore of the beach is the beautiful end of our tour in the beautiful and majestic Gorge Samaria – the most famous of all Crete Gorges! You can read here further information about the route in Samaria Gorge. The gorge of Agia Irini (St. Irene) in Selino is located in the west of the White Mountains, 43 km from Chania. The gorge has a unique beauty , it was named like this from the village of Agia Irini located near the north entrance. It has a length of 7.5 km and is part of the European E4 path. The time required for crossing it is about 3 hours. The village of Sougia with its beautiful beach is 5 km from the southern entrance of the gorge. In the gorge shelter many animal species like the Cretan wild goat (Kri Kri) and grow several species of trees, plants and herbs. During the Turkish occupation in the gorge found refuge many Greek rebels. In the surrounding area is the beautiful church of Christ, built in 1358 AD and the church of St. George, which was built in 1460 AD, and other important monuments and sights worth seeing. The Gorge of Agia Irini is the second most important of the Crete Gorges after Samaria Gorge. Imbros Gorge is certainly worth a visit, since it is one of the most beautiful and famous Crete Gorges. Its landscape will enchant you! It is near Sfakia, south of Chania. It starts from the small plateau of the village of Imbros and ends at the village Komitades offering wonderful views of the Libyan Sea. Its length is 7 km and is easy to be crossed any time of year. The time required is approximately 3 hours. It is a gorge with rocky formations, narrow in some points and wild vegetation with trees, literally growing through the stones and rocks! The most beautiful part of the gorge is in the middle of the route where the rocks are very close to each other and the distance that separates them is only 2 meters. 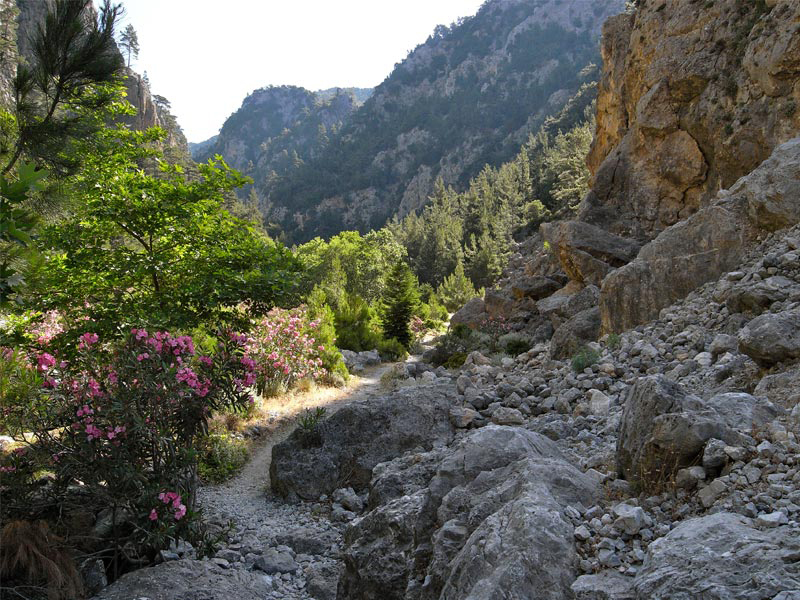 Kourtaliotiko Gorge is located in the prefecture of Rethymnon about 22 km south of the city. 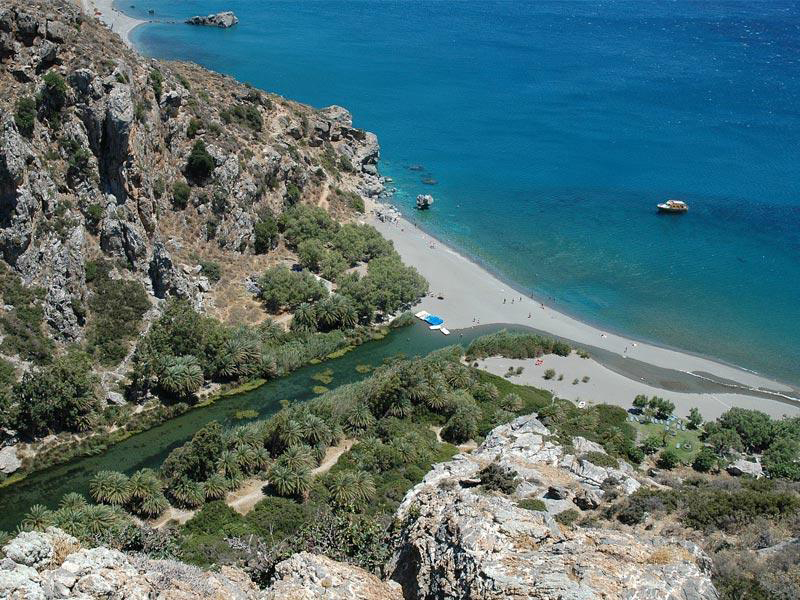 It starts from the village Koxare, follows the river Kourtaliotis and ends in the beautiful beach of Preveli. Halfway through your journey you will meet the road that passes through the gorge with parking and paths leading to the beautiful church of St. Nicholas. Towards the end of the gorge there is a point that resembles a tropical lagoon and is called the beach of the palm trees. The gorge has incredible beauty and the scenery is wild. It has rich flora and fauna and the river is divided into five streams which then are united and form small lakes and a huge waterfall! Throughout the route you will notice that the gorge is narrow and the rocks are huge and full of small caves. 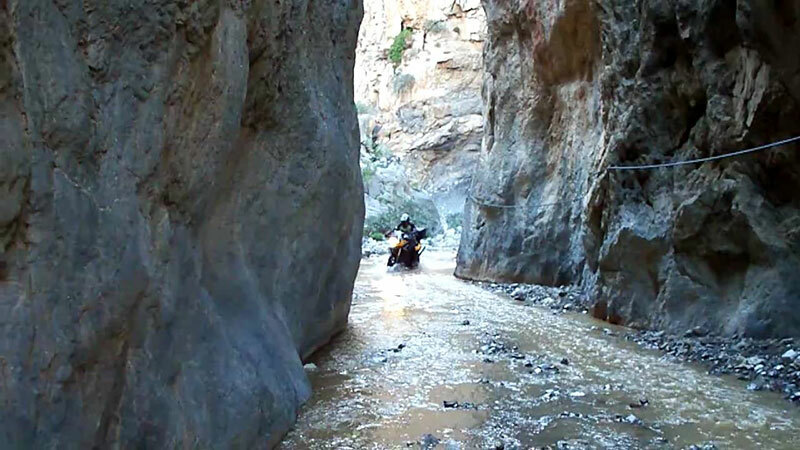 Kourtaliotiko Gorge is a miracle of nature, as many other Crete Gorges! It is really worth a walk to see the beauty and wildness of the Cretan landscape! The impressive, wooded Patsos Gorge located inland of Rethymno Prefecture, in the northwestern part of the municipality of Amari. It is a beautiful gorge, crossed by a small river. Its length reaches two kilometers and you will need 2 hours in total to cross it. The height difference between the entrance and its highest point, reaches 240 meters. In the gorge, you will find rest areas and a bird observatory. You will be impressed by the huge trees and lush vegetation, the high rocky walls and the chapel of St. Anthony, built in a large cave. 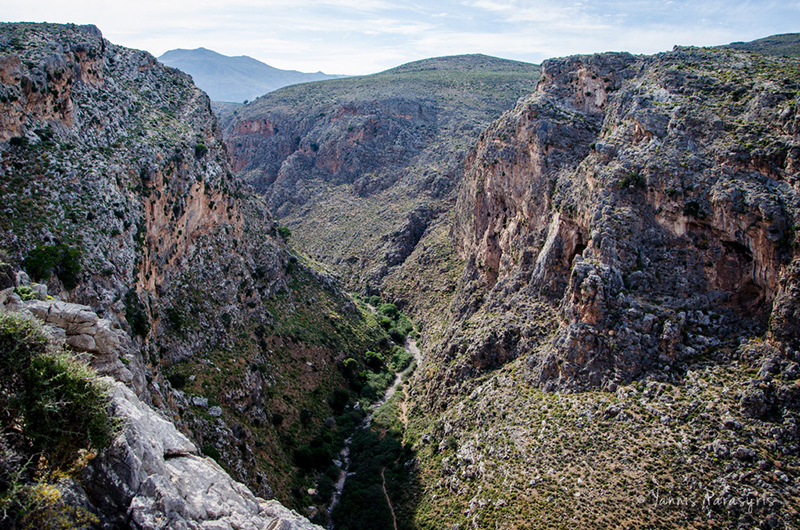 It is one of the most popular Crete Gorges for hiking adventures. 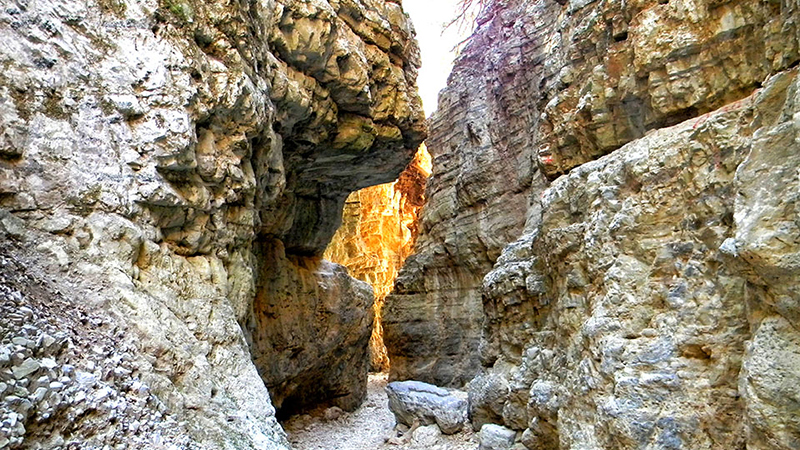 The gorge of Agios Nikolaos or Rouvas Gorge is located in Heraklion. You can start from the Lake Zaros, and after 1.5 km you will come across the Monastery of Agios Nikolaos (St. Nicolas). You follow the path to the left and ascend towards the entrance of the gorge. The spectacle is not very pleasant since in 1994 that point burned (it is about the 1/3 of the gorge). But when you skip this point and keep hiking, you will see the real beauty! The length of the gorge is 4 km and the route can be uphill or downhill. During the winter months and the early days of spring, the stream of the gorge is still flowing. All along the gorge there are resting places and fountains. Agiofarago Gorge, one of the special Crete Gorges, is located in Heraklion, between the Monastery of Odigitria and the seaside village Kaloi Limenes. It will take you about 20 minutes to cross. 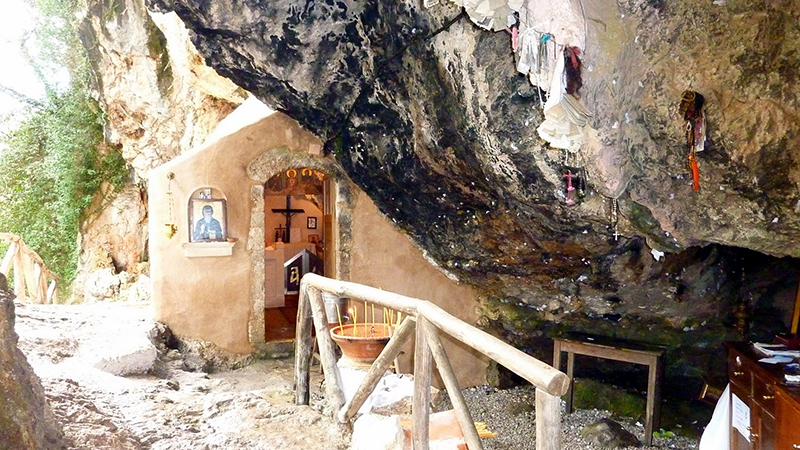 At the beginning of the route, you will see the church of Agia Kyriaki which is in a cave! In the gorge is also the church of St. Anthony which is also partly in a cave and was the center of the ascetics of the region. The several archaeological findings in Agiofarago, show that there has been activity in the Minoan and Venetian times. Characteristic is the Minoan, circular, domed tomb near the church of St. Anthony. Shortly after, you will find a cave with a low entrance and a large room. The Abbot of the Monastery of St. Anthony lived there. According to history, Agiofarago was inhabited by hermits since at least the 11th century. When you cross the gorge you will reach a beautiful beach overlooking the Libyan Sea! We recommend good to keep water with you, as in the gorge there are no sources of water. The gorge of Tripiti in Heraklion is located south, near the village of Lentas. It got its name from the church of Panagia Tripiti, which is built inside the cave of the gorge. It is relatively small in length and you can cross it even by car or motorbike. The scenery is magical and the tall cliffs that rise in many parts of the gorge are breathtaking! 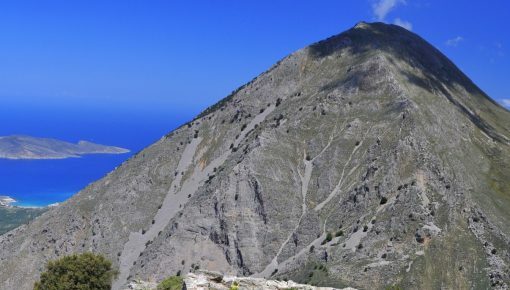 To get there, you have to cross by your car a part of Asterousia Mountains and passing from Vasiliki village. The entire route is amazing and quite difficult at the same time, because of the dirt road. But it is worth a visit and the scenery will amaze you! 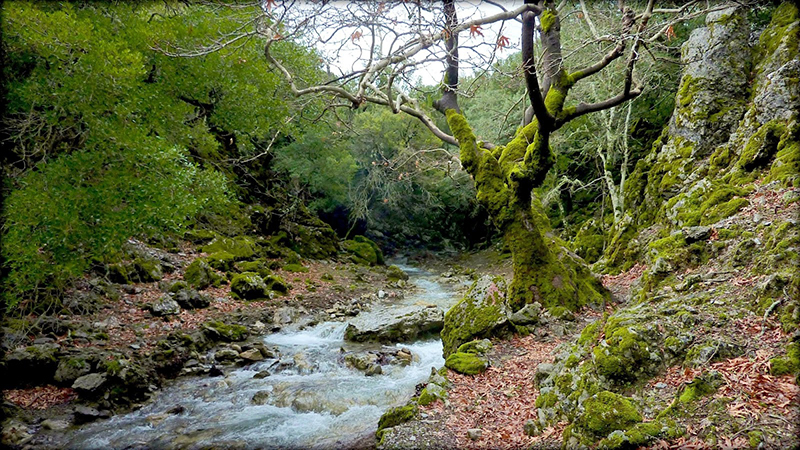 The wild nature of Crete Gorges, once again, will leave you speechless with the few trees that grow inside the stone slopes of rocks and the high mountains surrounding the area! After you have passed the gorge, you will see the beautiful beach of Tripiti with crystal clear waters! There, you can spend a day of relaxation or even to camp under the trees! The Gorge of the Dead or else, the Gorge of Zakros is located in the municipality of Itanos, 39 km southeast of Sitia. It begins shortly after Pano Zakros and ends in the beautiful Kato Zakros with the crystal beach! When you arrive at the entrance of the gorge, leave your car at the designated area and start hiking. At the end, you can take the bus from Kato Zakros to take you back to your car. The gorge is very nice and all along the route you will come across many small caves which, in Minoan times, were used as tombs. That’s why it is called the Gorge of the Dead. The duration of the hike is about 1.5 hours and the scenery is breathtaking! Every year, the gorge welcomes hundreds of people from abroad and Greece that come to enjoy the beauty of the imposing landscape and then, swim in the beautiful Kato Zakros! It is an excursion highly recommend to lovers and fans of the wild beauty offered by Crete! 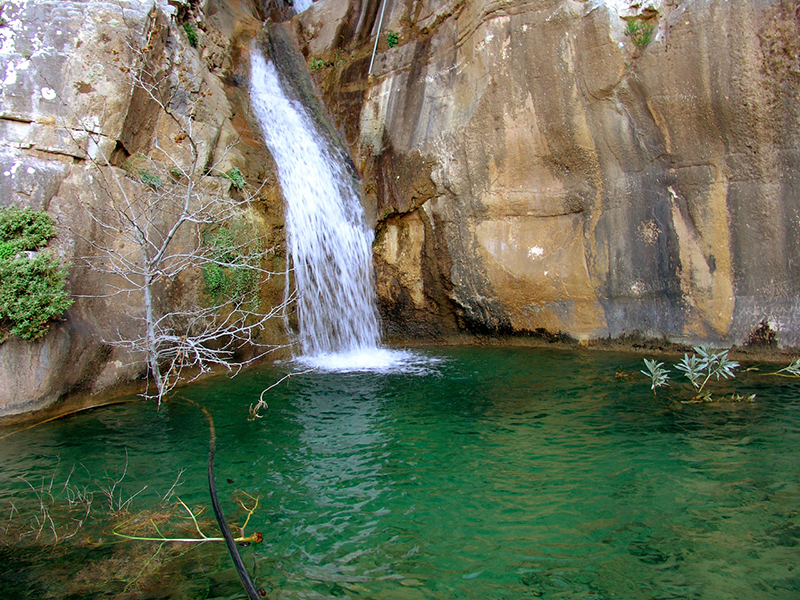 The gorge is located in Ha, north of Ierapetra. The entrance of the gorge is located at an altitude of 370 meters and the output goes down and ends at an altitude of 140 meters. Towards the end of the gorge there is a large waterfall at a height of 215 meters. The gorge has also rich flora and fauna. It is one of the famous and magnificent Crete Gorges. It has been visited by many travelers from around the world since it belongs to the 10 most beautiful gorges of Europe! It is a wild gorge, most appropriate for experienced hikers having all necessary equipment. The visit to the gorge of Ha is a challenge! 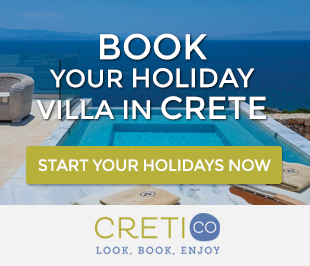 If you accept it and you will be rewarded with an incredible view and an amazing Cretan experience! Posted on 09 Sep 2015 in Trip Ideas and tagged Cretan Gorges, Hiking In Crete.